Should survive small-screen transition without degradation. A good quiet-night-at-home movie. Director Betty Thomas' name in the opening credits of "28 Days" came as a big relief leading in to what looked like a soft-pedaled, politically corrected comedy about a happy-go-unlucky drunk -- played by button-cute Sandra Bullock -- wise-cracking her way through rehab. It was reassuring to see that the woman holding the reins was a filmmaker who certainly knows how to turn a sow's ear into a silk purse. I mean, if she could make Howard Stern not only presentable but borderline sentimental (and without a hint of saccharine whitewash) in "Private Parts," surely a touchy subject like alcoholism is safe in her hands. And so it is. Striking a sure-footed balance between its addiction woe and impudent humor, Thomas isn't afraid to scoff at twelve-steppers and include jests of questionable taste while still pulling off a story of a woman's difficult personal journey toward sobriety. 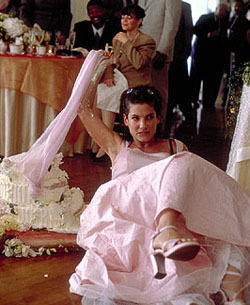 Sandra Bullock is very well cast as Gwen Cummings, a beer-for-breakfast addict extraordinaire, sentenced to rehab after one of her regular booze-and-pills binges leads to ruining her sister's wedding (I could have done without the destroyed cake cliché) and commandeering the limousine, which she crashes into a house at 30 miles per hour. Trapped at a restrictive retreat called Serenity Glen with a menagerie of recovering junkies who have traded substance abuse for a predilection toward chanting nauseating affirmations, she reluctantly begins to emerge from her semi-permanent stupor -- thankfully without losing any of the edge that made her a likable drunk. Not wanting to face her problem, Gwen's primary defense system is spiteful sarcasm, which she dispenses generously and at the slightest provocation as she crashes through the symptoms of denial and withdrawal. "28 Days" has respect for its subject matter but when Thomas introduces the story's obligatory episodes of harsh reality (a patient's tragic overdose, for instance), she refused to give in to the melodrama lurking around every corner. Instead, the movie happily mocks such sappiness by playing up Gwen's tenuous teenage roommate's obsession with a hilariously over-the-top soap opera. That teenager -- a sweet, helpless heroin addict in her second rehab stint -- is played by a superb young actress named Azure Skye, who is the movie's emotional linchpin, feeling tenfold the kind of painful emotions that only visit Gwen in disorienting flashbacks of her arduous childhood with a perpetually pickled and frequently passed-out mother. The cast also includes Elizabeth Perkins as Gwen's infuriated sister; Steve Buscemi in a rare straight-man role as a weary, weather-beaten rehab counselor; Dominic West ("A Midsummer Night's Dream") as Gwen's still-addicted boyfriend and a bad influence on her recovery; and Viggo Mortensen ("A Walk On the Moon") as a jaunty pro baseball player who checks himself in to the clinic and becomes a distracting temptation for Gwen. Other addicts include a comedically queeny German (Alan Tudyk), a pudgy pick-up artist (Mike O'Malley), and a nervous-nellie retiree (Diane Ladd). Thomas -- whose other films include "The Brady Bunch Movie," Eddie Murphy's "Dr. Dolittle" remake and the scathing Leno-vs.-Letterman cable comedy "The Late Shift" -- finds both trenchant humor and genuine sentiment in "28 Days." While it's never saddening the way a pure drama ("Leaving Las Vegas") or a darker comedy ("Permanent Midnight") about substance abuse would be, the movie doesn't shy away from its characters' pain (deeply-scarred Skye habitually cuts her arms because "it feels better" than coping with her emotions). But it's also not afraid to get a good laugh at any characters' expense. It's a tightrope act, but Thomas makes it look easy.